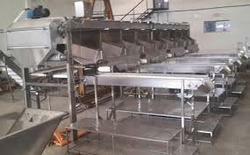 Inspection Conveyor System, In this area, one size most certainly does not fit all! We are often asked to produce special purpose conveyors that must operate under unusual conditions, or perhaps interect with their load in unusual ways, or - in some cases - are just downright exotic! Looking for Industrial Inspection Conveyor ?